One of the things of modern art that I like the most, is the way the artists can experiment. They take art to new boundaries, in the way they choose to express themselves, and also, the technical resources they have to do it. However, I related these experiments as a new phenomenon, from the last 100 o 150 years. But Doménico Beccafumi proves me wrong. Doménico is the son of Giacomo di Pace, a peasant. Later on he is adopted by Lorenzo Beccafumi, the owner of the ranch where the artist and his father lived. Lorenzo is the one that, watching his newly adopted artistic gift, encourage him to study painting and gives him his last name. Doménico then studies in his birthplace, Sienna, then he moves to Rome to finally return to his hometown. The story of Papirius was first told in the Noctes Atticae of Aulus Gellius, a Latin writer born in Rome. He tells that the boy Papirius was taken by his father to the Roman senate under the strict condition of never to reveal what he hears on it. Questioned by his mother, Papirius cannot keep the secret and he tells her that the senate was discussing if it was licit for men in Rome to have more than one wife. In angry, his mother gathers her friends and they go to the senate to complain about the discussion. They asked the senators why a man can have two wives when women cannot have two husbands. Perplexed, the senators ask Papirius and his father for a meeting. The young boy then confess, in front of everyone, that he had revealed the secret of the previous discussion. Papirius is then acknowledged for his honesty gaining the entrance for all the meetings of the senate, at the same time that the presence of other children is strictly forbidden. Returning to the artist, he have to notice that, once he came back from Rome, he spent his whole life in Sienna, far away from other artistic movements. And it is this isolation that gives Beccafumi his stylistic originality. 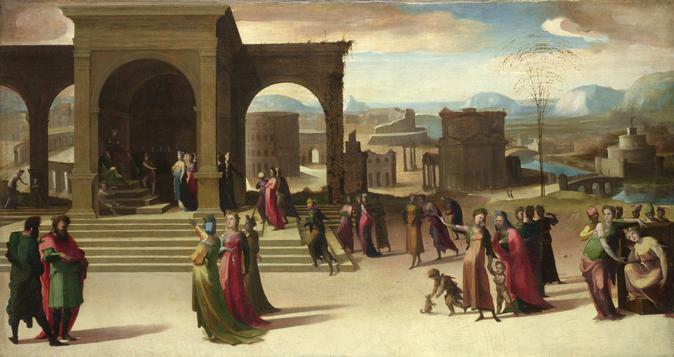 Although he mostly painted religious motifs, Beccafumi could digress, giving us a painting like The story of Papirius. On one hand, Beccafumi paints two times in the same canvas. In the back, far at the left, we see Papirius being questions by his mother. The kid we see with his arms crossed, at the beginning was reluctant to tell about what was discussed in the senate. But finally he did. More at the centre, we see the second scene in the story: all the women going to protest to the senators, with beards, why they could not have 2 husbands if men are allowed to have 2 wives. More on the right, we see more women that are spreading the rumor of the claim. On the other hand, the painting has a surreal feel 400 years before the movement gains its strength. Look at the buildings at the background. The constructions are strange and they do not follow a semi logical location; besides that many of them are ruined. Among them, one can identify two Roman monuments: at the center, behind the senate, we can see the coliseum and, more at the right, the Castel Sant’ Angelo. ~ by Álvaro Mazzino on July 16, 2010. Where would you guys rank these amongst Kanye West’s current sneaker lineup? Get a better look at them below and be sure to stay tuned to Sneaker Bar for more news on upcoming adidas Yeezy releases in 2018. This entry was posted on July 16, 2010 at 13:17 and is filed under Mannerism, Renaissance.You can follow any responses to this entry through the RSS 2.0 feed.You can leave a response, or trackback from your own site.